When it comes to their own ability to thrive, merchants who use the ShopKeep iPad-based point of sale system are an optimistic bunch. In a recent survey of its small business customers, ShopKeep found that a whopping 97 percent of them are at least somewhat confident that their business will be successful a year from now. But they’re less convinced that the rest of the country will so do well. Confidence in the overall economy is down 5 percent from last quarter, and only 39 percent of ShopKeep merchants believe the economy is in better shape today than it was a year ago. ShopKeep’s Q2 Small Business Index is a data set based on ShopKeep merchants’ same-store sales data and a June email survey of 1,260 U.S.-based merchants. In fact, the survey found that 62 percent of ShopKeep merchants have not raised prices in 2015, and 72 percent do not plan to raise them at all this year. According to ShopKeep: “Instead of raising prices, SMBs remain focused on implementing sustainable approaches to growing their business” such as increasing or implementing promotional marketing/advertising, expanding product lines or services, hiring new employees, and expanding operations. As for challenges, small business owners face changing wages, EMV compliance, and contactless payments. Nearly 90 percent of ShopKeep merchants have at least one employee and the average hourly rate they pay is $10.83—54 cents an hour higher than the national average and $3.58 greater than minimum wage. Nearly 70 percent of businesses expect to hire this year, and half of owners say that “finding and retaining a quality workforce” is a concern for their business operations. While a majority do not feel pressured by national retail chain wage policies to raise employee wages, 20 percent report that they do feel pressure. Most ShopKeep customers are aware that they must be prepared to accept the new “chip and pin” credit cards by October 2015. (Those whose payment processing equipment is not EMV chip card compliant by then will pay 100 percent of any fraudulently presented credit card transactions.) 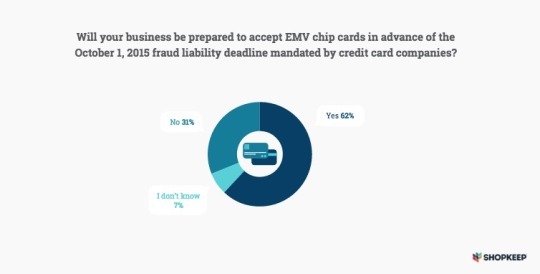 ShopKeep found that 62 percent of businesses are already prepared to accept EMV chip cards, but 31 percent will not be ready in time. Savvier merchants are taking advantage of the EMV transition as an opportunity to upgrade their business technology to accept new and upcoming payment types, including contactless payments such as such as Apple Pay and Google Wallet. 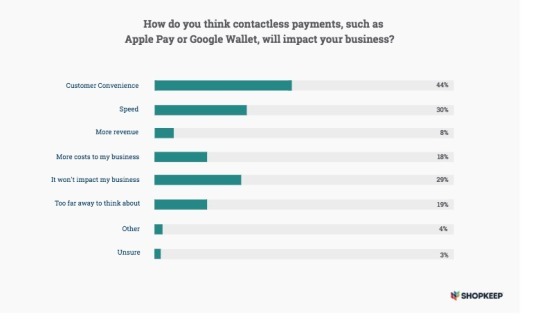 While ShopKeep reports that “there is still a significant amount of resistance and need for further education of contactless payments” 82 percent of merchants agreed this quarter that contactless payments will boost business, with increased customer convenience, speed, and revenue.